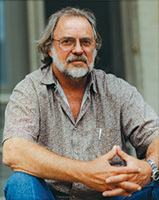 Bill Wittliff is a distinguished photographer and writer whose photographs have been exhibited in the United States and abroad and are the subject of three books, Vaquero: Genesis of the Texas Cowboy, La Vida Brinca (UT Press: 2006), and A Book of Photographs from Lonesome Dove (UT Press: 2007). As a screenwriter and producer, his credits include The Perfect Storm, The Black Stallion, Legends of the Fall, Lonesome Dove, and others. Co-founder, with his wife, Sally, of the highly regarded Encino Press, Bill Wittliff is also a past president and Fellow of the Texas Institute of Letters, a recipient of the Texas Book Festival Bookend Award, and the Texas Medal of Arts. He is also a member of the historic Texas Philosophical Society and the Academy of Motion Picture Arts & Sciences. In 2008, Wittliff was asked to join the board of the National Portrait Gallery in Washington D. C., and was inducted into the Texas Literary Hall of Fame. Together the Wittliffs also founded, with the support of Texas State, the Wittliff Collections, which include the Southwestern Writers Collection and Southwestern & Mexican Photography Collection. In 2012, he was chosen "Man of the Year" by the Kappa Sigma Fraternity. He is the fifth initiate of the Tau Chapter to be awarded this national honor.